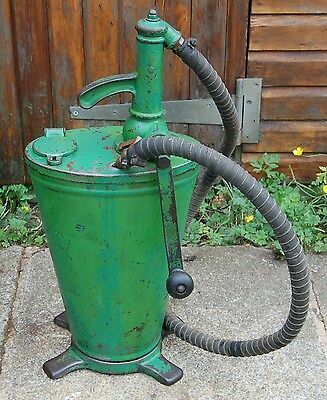 I visited a local tool sale on Sunday in the village and I found a very interesting petrol pump, or at least part of it. I took some notes off the ID label and it is a Gilbert & Barker Model T236-27. I have searched Google and it does not come up with a hit for this model of pump, anyone on the forum a vintage pump expert? I went down again and have taken a more detailed look. Its not a petrol pump but an oil pump and it is crank wound not pumped like later castrol type pumps. Its very old, 1920/30's i would hazard a guess. Look under the name 'Gilbarco' - recall seeing that brand on petrol bowsers a lot in my youth. Is it one like this? Isn't that a Baelz gear oil pump? No, its much older than the gear oil dispensers. It looks very much like a petrol pump. It has a dial and a cranking handle that is geared. I haven't been back down the tool sale place but I presume its still probably there. Mine is Speedwell Oils too! Mine is now in Fina colours.